MEET Arifa, she’s a little lovelorn, in her mid-20s lives at home with Mum and sister, has dreams of finding the right guy, wants a decent career and her own place. The beauty of Sadia Saeed’s first feature film – called ‘Arifa’ and named after the main character – as a writer-director, is that she centres her film around a very believable person. Arifa (Shermin Hassan) could be your everyday kind of young woman living in a big city. Yes, she’s Asian, from a Pakistani Muslim background and has issues with the (very) inadequate men who cross her path. The film has its European premiere tomorrow at the East End Film Festival at Rich Mix in Shoreditch, London. (see listing below). If it starts a little bit Bridget Jones (and it does) with Arifa rather uncertainly and quite comically telling her date, she’s a bit short of experience – don’t be fooled into thinking this is some form of brown chick flick. It isn’t. 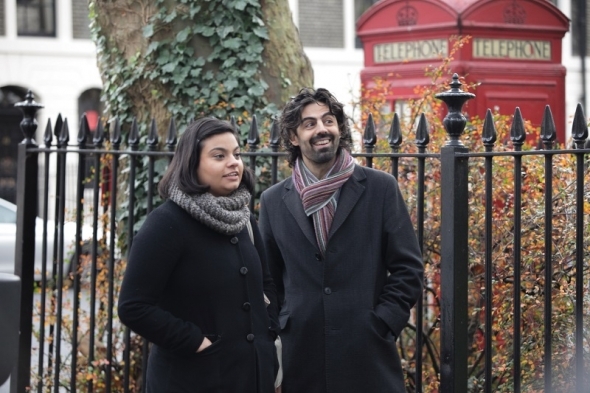 Arifa’s dating travails in the larger scheme of things are not that insurmountable and Saeed is right – her film actually has a deeper and more reflective core. And what is well done is that Saeed introduces it organically into her narrative – some may be disappointed, we don’t have more of the Bridget Jones’s cringe type moments, but clearly Saeed wants to move the story into a more dark and serious frame. She does this and here’s why more precisely. Saeed puts this more and more centre stage in ‘Arifa’ but it also adds some commentary as to why her romantic relationships are riven by suspicion and mistrust. Arifa’s father in the film is played by Jeff Mirza, a veteran of the stand-up circuit in Britain. Saeed explained: “I wanted to highlight her relationship with her father and the other men in her life and maybe I was exorcising some of my own demons. “Arifa’s father is difficult – women often put their fathers on a pedestal and they shouldn’t really be doing that, the father daughter relationship is very complicated. The father-daughter awkwardness is well covered here – ‘Hameed’ (Mirza) is a proud man and thinks he knows one or two things about life, business and making your way in the world and is keen to impart his knowledge and insights to his oldest daughter. She, on the other hand, begins to see him for what he is…and well should we say any more? Saeed has made a very watchable film; there are some nice touches along the way and the production values are strong with good cinematography and design – and successful pop group Level 42 founder member Mike Lindup provides the music. It’s a little darker and blackly humorous than it might seem at first, but Arifa is an interesting character and Hassan, in what looks like her first starring role, gets the mixture of vulnerability and independence right. There’s a mixture of private funds and a successful Kickstarter campaign that helped get the film to the screen. Saeed was born in Karachi but spent her early life in Australia and after graduating from the University of New South Wales, embarked on a career writing and making films, both in Australia and Pakistan. She is now based in London and has been here for seven years. Last year a comedy farce she wrote ‘The Deported’ was produced by Kali at the Tristan Bates Theatre in the West End.